If the EU were a soccer team, it would not lose games for lack of a game plan or due to inadequate capacity. The problem is that the team as a whole is not playing cohesively, and all of the top players are struggling individually, owing to messy problems at home. ABU DHABI – The European Commission, the International Monetary Fund, and the OECD predict that, on average, the European Union’s economy will grow by 1.9% next year, a rate that is broadly consistent with the average of 2% expected for this year. But the picture this paints may prove to be overly optimistic, not only because the growth rate itself is likely to disappoint, but also because there is significant downward pressure on the EU’s growth potential beyond 2019 – pressure that, at present, European leaders seem unprepared to counter effectively. If the EU were a soccer team, it would not lose games for lack of a game plan or due to inadequate capacity. Worth nearly $19 trillion, the EU’s economy remains the world’s second largest, constituting about one-fifth of the global output. The problem is that the team as a whole is not playing cohesively, and all of the top players are struggling individually, owing to messy problems at home. Over the last year, small steps – such as strengthening the collective financial safety net – have been taken to enhance the EU’s overall capacity to handle bumps in the road. But the economy’s overall architecture remains incomplete. 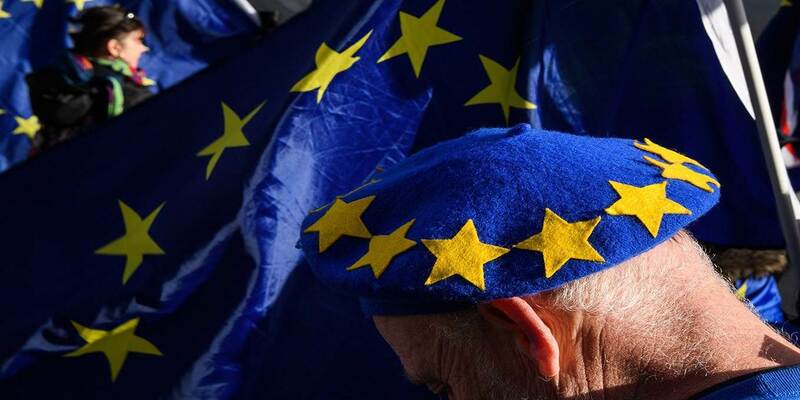 The problems are particularly notable in the eurozone, which is challenged by slow progress on banking union, inadequate fiscal-policy coordination, and political divisions. And the forces of fragmentation will only strengthen. For starters, populist political parties and leaders are increasingly influential, having capitalized on widespread anxieties about identity and migration, together with frustration with mainstream elites, to win support, and even power, in many countries. But the transition from campaigning to decision-making – whether within parliament or, as in Italy, within the governing coalition – has proved to be difficult for several of the anti-establishment parties, given their lack of comprehensive policy platforms. Together with the election for the European Parliament scheduled for next year, this added layer of uncertainty complicates region-wide coordination and decision-making, at a time when many policymakers are already preoccupied with the as-yet-unresolved issue of Brexit. As a result, they have even less capacity to dedicate to removing impediments to productivity growth and building a more agile economy capable of responding to rapid technological advances and changes in the global economic environment. It doesn’t help that Europe’s liquidity environment is also becoming less supportive. Having already slowed its asset purchases, the European Central Bank is set to wind down its massive stimulus program at the end of this year. ECB President Mario Draghi has signaled that an interest-rate hike is likely to follow by the end of his term, in October 2019. But while these factors threaten to exacerbate the challenge of fragmentation confronting the EU economy, even a disjointed team can secure a victory if its star players manage to perform strongly enough. Unfortunately, domestic issues that defy simple solutions and constrain both national and European policymaking are roiling many of the EU’s biggest economies – France, Germany, Italy, Poland, Spain, and the United Kingdom. France is being shaken by the “Yellow Vest” protests against President Emmanuel Macron’s reform agenda. Germany is facing a deep political transition, as Chancellor Angela Merkel prepares to retire at the end of her current term. And Italy’s populist government is at loggerheads with the European Commission over its proposed 2019 budget, which is also based on optimistic assumptions for GDP growth. As for Poland, its government has embraced so-called illiberal democracy, and is pursuing policies that many view as inconsistent with the EU’s values and vision. Spain’s government, for its part, remains weak. And in the UK, divisions within the ruling Conservative Party are hampering progress toward an orderly Brexit process, precluding meaningful pro-growth and pro-productivity policy initiatives. With these challenges unlikely to be resolved soon, Europe’s key growth engines seem set to lose steam throughout 2019. Meanwhile, policy efforts to promote the EU’s longer-term growth potential will probably remain the exception, rather than the rule. All of this will happen within an external environment that is less supportive, both economically and financially. Already, the EU’s export engine is not powerful enough to offset weakening domestic drivers of growth. And yet exports are set to suffer further, as a slowing China undermines external demand. Meanwhile, financial-market volatility is likely to continue, amid slowing global growth, technical vulnerabilities, and the reversal of volatility-repressing monetary expansion, which included ample and predictable liquidity injections by central banks. So the EU “team” is set to face serious challenges both in domestic play and international competition. But the news is not all bad: technically, the EU has both the game plan and the inherent strengths it needs to perform. The economy has recovered from the worst of the global financial crisis. A lot of work has been done to identify the policy steps required to achieve strong and inclusive growth, reduce financial vulnerability, and stop the erosion of the pillars of longer-term prosperity. And the EU has considerable untapped or underused internal capabilities. Unleashing them in the context of a coordinated strategy could improve the EU’s economic performance and prospects considerably. Success will require political leaders who are capable of inspiring the public and willing to pursue consistent pro-growth policy initiatives. The longer it takes for such leaders to emerge, the more difficult it will be for the EU to avoid a relegation battle. WASHINGTON—U.S. bank regulators on Thursday faulted Barclays BCS +0.61%▲ PLC, Credit Suisse Group AG CS +1.55%▲ , Deutsche Bank AG DB -0.81%▲ and UBSGroup AG for shortcomings with their “living will” plans for winding themselves down in a crisis. The Federal Reserve and the Federal Deposit Insurance Corp. said each of the foreign-owned firms had shortcomings with how their U.S. units communicate and coordinate with their overseas parents during a bankruptcy or other stress event. Credit Suisse also was cited for shortcomings related to estimating the liquidity needs of its U.S. firm. The censures, which amount to a slap on the wrist, are less severe than the finding of a “deficiency,” which could lead to more stringent capital and liquidity requirements on the firms. The banks must address the shortcomings when they next submit living wills in 2020. The plans are meant to show how a firm would wind itself down in a crisis without turning to U.S. taxpayers for a bailout. Thursday’s move marks the latest regulatory hurdle for Deutsche Bank, which has faced a string of allegations and costly legal settlements tied to failures to prevent money laundering and other banking violations. The firm, in a written statement, said it was pleased U.S. regulators found no deficiencies with its plan and said it would address the feedback it received from the agencies. “We will continue to dedicate significant resources across the firm to further ensure that our U.S. operations can be resolved without posing systemic risk to the financial system,” the German lender said. A representative for Barclays couldn’t immediately be reached for comment. Under the 2010 Dodd-Frank law, eight U.S. banks and four foreign banks designated as crucial to the broader financial system must file plans showing they have a credible strategy to go through bankruptcy without causing a broader economic panic, one of many provisions in the law designed to prevent a repeat of the 2008 bailouts. Thursday’s rebuke of the foreign firms is relatively mild compared with the criticism lobbed in recent years against the eight U.S. firms that also must go through the process of developing credible “resolution” plans. In 2016, the Fed and the FDIC shocked the firms by determining five of eight had deficiencies. Last year, all eight big U.S. banks avoided a major regulatory rebuke, though each of the firms was cited for smaller problems. The U.S. banks must next submit their plans in 2019. Since the crisis, the four foreign firms have significantly reduced the size and risk profiles of their U.S. operations while increasing their capital and liquidity levels, the Fed and FDIC said in a press release. At the same time, the ability of the firms to wind themselves down “will change as both the firms and markets continue to evolve,” the statement said. Editor's Note: Kitco News has officially launched Outlook 2019 - Rush To Safety - the definitive reference for precious metals investors for the new year. We chose this year's theme as financial markets face growing uncertainty. With volatility on the rise, how do you protect yourself? Click here daily to see updated content. (Kitco News) - King dollar is preparing to end the year on a strong note, but its reign could come to an end next year as fears of a global economic slowdown could stop the Federal Reserve from raising interest rates aggressively in 2019, according to some analysts. Button’s comments came after the Federal Reserve’s December monetary policy meeting, where they decided to raise interest rates for the fourth time this year, the ninth in the current cycle. However, the pace of rate hikes looks to be slowing as the U.S. central bank, in its latest economic projections, estimated only two rate hikes next year. Fed Chairman Jerome Powell also noted in a press conference following the announcement that interest rates have hit the lower bound of the central bank’s range of estimates for the neutral rate. While the Federal Reserve could end its current tightening cycle by the second half of next year, economists are still expecting further tightening from other central banks, in particular, the European Central Bank, which plans to start raising interest rates by the end of the summer. “While markets are anticipating limited Fed action next year, investors appear to be underestimating the odds of tightening by central banks abroad,” said currency analysts at CIBC World Markets. Some currency analysts have said that the closing gap in global monetary policy will favor the euro over the U.S. Dollar. 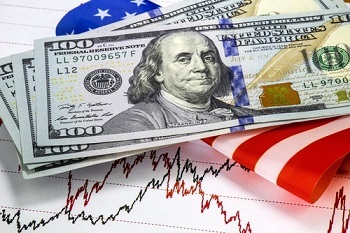 However, less restrictive U.S. monetary policy is not the only part of the equation that is expected to push the U.S. dollar from its current perch. Simon Derrick, chief currency strategist at Bank of New York Mellon, said that investors need to start paying attention to the flattening yield curve, especially as the long-end of the curve underperforms. “The yield curve could be telling us an awful lot about where the global economy is heading and it's not good news,” he said. “I think the Fed is going to be sensitive to these global factors,” he said. Derrick added that a weaker U.S. will go a long way to relieve the pressure in emerging markets, especially in Asia, which would help the global growth outlook. While the U.S. and the global economy are expected to continue to grow next year, the pace is expected to slow. In October, the International Monetary Fund said that the world economy is projected to expand by 3.7% next year, down from its July forecast of 3.9%. The U.S. economy is expected to expand by 2.5%. Meanwhile, in its December projections, the Federal Reserve said that it sees the U.S. economy growing 2.3% next year, down from 3% growth expected in 2018. Derrick added that weak economic growth will weigh on U.S. equity markets, which in turn will add further pressure to the U.S. dollar. “A weaker U.S. dollar would solve a lot of global problems. I think the positive factors would outweigh negative factors,” he said. Tax cuts introduced at the start of the year, helped to stimulate the nation’s economy and boosted equity markets, which created an attractive environment for the U.S. dollar. However, most economists are expecting that the sugar rush created from the tax cuts is starting to wear off and will be less of a driver in 2019. On top of that, the U.S. government faces a new problem of growing deficit. In a report in July, the White House Office of Management and Budget released its mid-season review and projected that the U.S. deficit would hit $1 trillion by the end of the 2019 financial year. Both Button and Derrick said that U.S deficits will be a drag on economic growth. “The deficit needs to be dealt with, but it will be almost impossible at this point,” said Button. Derrick said that he sees only one scenario where the U.S. dollar could benefit next year — if there is a full-blown global recession and investors flee to the greenback and the safety of U.S. Treasuries. Analysts at TD Securities also see a substantial deceleration in global growth as the biggest threat to their bearish call on the U.S. dollar. Derrick said that he thinks the euro could do well in an environment of slower economic growth. “Basically Europe just has to stand still and maintain the status quo and the euro would look better than the U.S. dollar,” he said. Currency analysts at ING see potential in Japanese yen as market volatility picks up through 2019. “We want to hold a strategic long JPY volatility position through 2019. The timing of the upside break-out is uncertain, so we opt for a calendar spread, selling 3m against buying 12m volatility,” the analysts said. Button said that he sees currency commodities — Canadian dollar, Australian dollar — as outperforming next year, especially in the second half of the year when recession fears appear to be overblown. For some market analysts, gold and commodities look to do well in 2019 because of a weaker U.S. dollar. Most commodity analysts look for gold prices to average around $1,300 an ounce next year. Venezuela is looking for a little help from its friends. Earlier this month, Venezuelan President Nicolas Maduro visited Russian President Vladimir Putin in Moscow. According to Putin’s spokesman, the purpose of the meeting was to discuss ways that Russia could assist Venezuela financially. 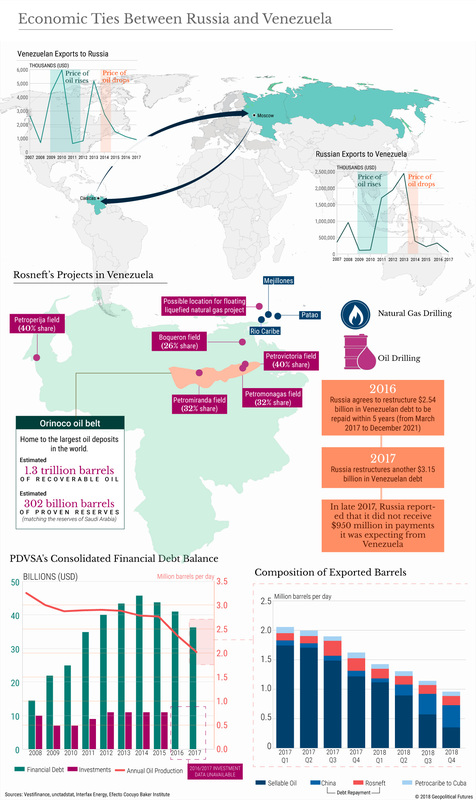 Venezuela has been in dire financial straits for years and has been looking for support from its allies after low oil prices and U.S. sanctions, among other things, brought its economy to the brink of collapse. Last year, Moscow offered Caracas a debt restructuring plan as Venezuela looked to be heading toward default. It’s not hard to see why Putin would want to help Maduro – as a major oil producer and target of U.S. sanctions itself, Russia, too, has been reaching out for support from friendly governments.